The SJW Series is designed with Quality and Function in mind. The roll-out turntable on the SJW-3 & SJW-4 allow for ease of unloading. For your convenience, the tank floors slope for easier cleanout. Intercont also manufactures another line of high quality part washers. 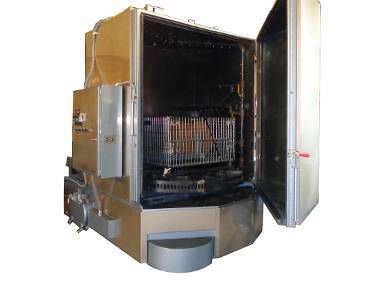 These machines were developed with standard specifications and dimensions for a wide variety of indutries. There are additional options that can be added to create a machine that will meet All of your washing needs. Click on the buttons to view a printable PDF of each Model. 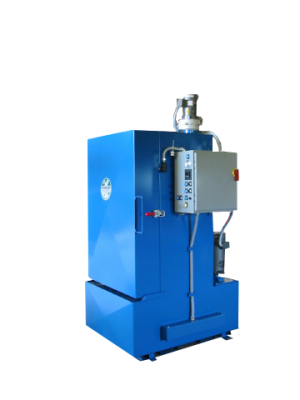 This machine is a heavy duty stainless steel, cabinet style, Front Loading Washer. 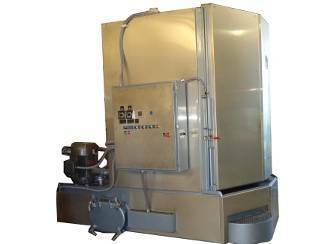 This system features a heated recirculating wash stage only, with dual 50 hp pumps. 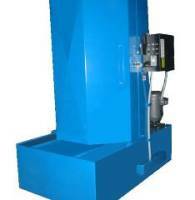 The pumps feature ABB soft starts and can be individually controlled with a selector switch. 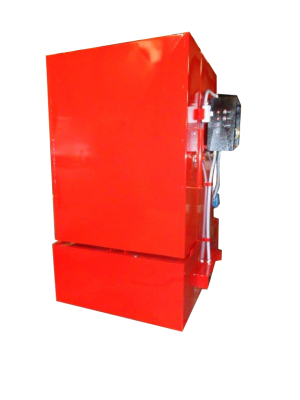 Other features are also upgraded on this unit, such as: Heater Kilowatts (72 kw) and Load Capacity (5,000 lbs). A remote control jog button is provided for forklift operator convenience. You Tube link to view various custom made Front Load Washers.